It's a wrap - finally! The cameras have been rolling for the last time on the Amiri & Aroha trilogy, with the final pick ups for Rere’s Children at last in the can. There were some scenes we were unable to film during the November shoot and I have been casting round for actors for some of the small but significant small parts. For the most significant of these roles, the detective who interviews gang leader Tautaru, I had to look no further than my colleague Andrew Wilson. Andrew proved a natural in front of the camera. It's always difficult doing green screen work out of context but Andrew had no problem getting to grips with the laconic detective who unwittingly draws the truth out of Tautaru. 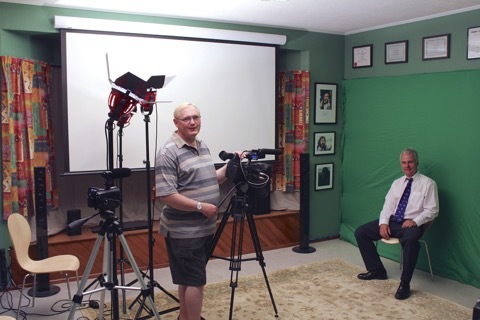 The shoot was in the best tradition of Indie film making, Andrew and edited the green screen footage into the sequence as soon as we completed the shoot. Thank you for being past of the film, Andrew. This gritty sequence, near the conclusion of Rere’s Children, is one of my personal favourites from the trilogy.